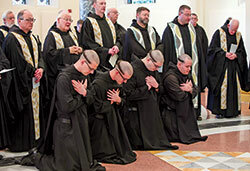 Four men professed solemn vows as Benedictine monks of Saint Meinrad Archabbey in St. Meinrad during a liturgy on Jan. 25 in the Archabbey Church of Our Lady of Einsiedeln. They are Brothers Simon Herrmann, Nathaniel Szidik, Joel Blaize and Jean Fish. Brother Simon is a former resident of Findlay, Ohio, and a graduate of the University of Dayton, earning a bachelor’s degree in communication management in 2010. He worked as an associate editor for the national office of Beta Theta Pi fraternity from 2010-11 and then at Saint Meinrad Archabbey as the director of alumni relations from 2011-14. He also served as a college intern for three summers in Saint Meinrad’s “One Bread, One Cup” youth liturgical leadership program. He is currently a full-time student at Saint Meinrad Seminary and School of Theology in his second year of theology. Brother Simon cuts the grass in the monastery courtyard, sandblasts designs into St. Meinrad sandstone, and enjoys sharing about monastic life to audiences that might be unfamiliar with this way of religious life. Brother Nathaniel is a native of Grand Rapids, Mich., and a 2011 graduate of the University of Dayton with a bachelor’s degree in chemical engineering. He worked for three years as a production manager in the byproducts and coal handling divisions at United States Steel near St. Louis. He also served as a college intern for two summers in Saint Meinrad’s “One Bread, One Cup” program. He is currently a full-time student in the seminary in his first year of theology. He is also the master of ceremonies for liturgies in the Archabbey Church. Brother Nathaniel also works as an American Council on Exercise certified personal trainer with Saint Meinrad’s wellness department and is one of the project organizers for Peanut Brother, an initiative of the monastery in which monks produce their own peanut butter. Brother Joel is formerly of Mount Carmel, Ill., and a graduate of Southern Illinois University-Edwardsville in Edwardsville, Ill., with a bachelor’s degree in English literature. He earned an associate degree at Wabash Valley College. 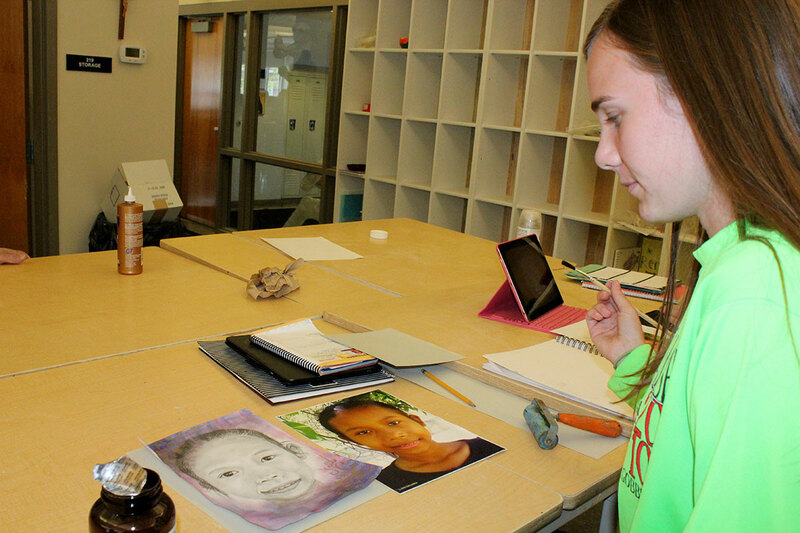 He also studied drafting and design at Ivy Tech Community College. Brother Joel formerly worked as a tool and die machinist and a design engineering technician at Hansen Corporation. He attended Saint Meinrad Seminary and School of Theology for one year before entering the monastery. Brother Joel currently works as an assistant in the liturgical music office, as an oblate dean, as webmaster of the Swiss-American Congregation and as a podcast host and composer. Brother Jean, formerly of Poway, Calif., is a 2013 graduate of Sonoma State University in Rohnert Park, Calif., with a bachelor’s degree in anthropology. He served as a youth ministry volunteer and an intern at St. Gabriel Parish in Poway, and he worked in the shipping department of a moving company. Brother Jean is an assistant in the monastery dining room and assistant guestmaster in the Archabbey Church. In addition, he is learning to make stained-glass windows and he expects to complete a master’s degree in theology at Saint Meinrad Seminary and School of Theology in May. 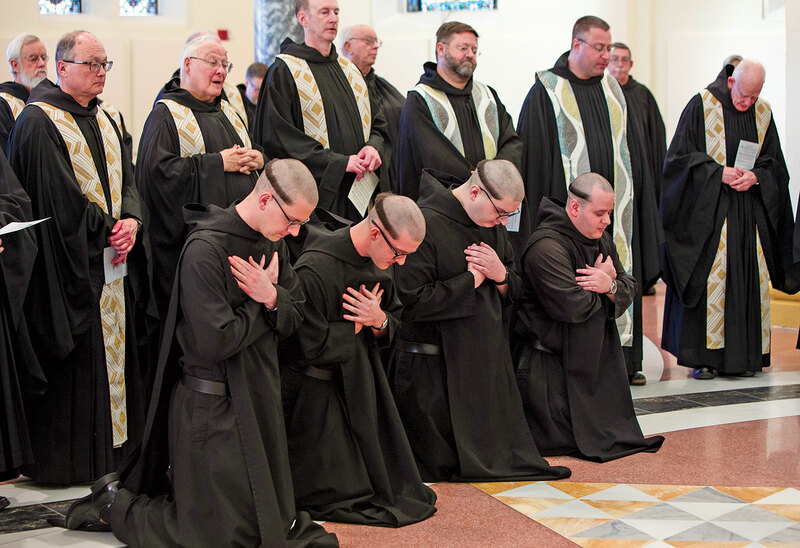 In professing solemn vows of obedience, fidelity to the monastic way of life and stability in the community at Saint Meinrad, the monks become full and permanent members of the Benedictine community.